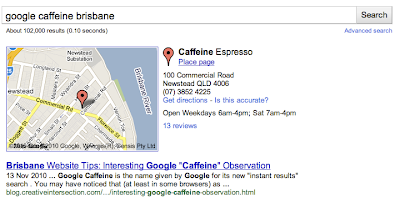 Brisbane App Development: Google Caffeine update - Geeeez it's FAST!!! People talk a lot about how fast the Google Caffeine indexing system is. Within 15 SECONDS(! 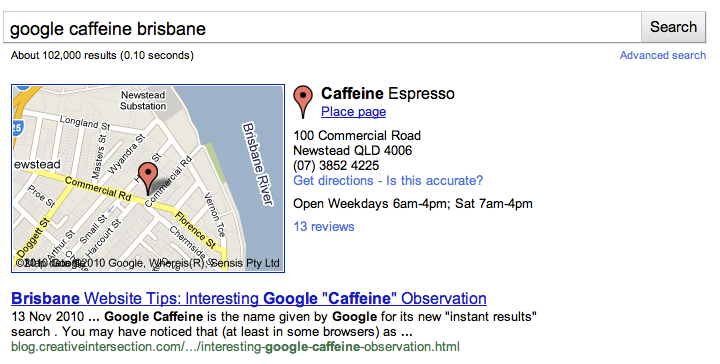 ), our blog entry was the first organic result found via Google when typing in "Google Caffeine Brisbane". Interestingly, and as we have noted on many occasions, that result will start to drop over the coming days - but it does prove one thing ... blogging and the Google Caffeine search can work very well indeed and can have almost instant cut-through. Creative Intersection can help you understand Google, SEO, Adwords advertising, and Website Design. Give us a call today on 1300 853 868.